First-responders in Alexandria, Virginia, are responding to a "dramatic increase" in opioid overdoses -- including one fatal case. Six people are known to have overdosed in Alexandria in just seven days, including one man who died, Alexandria police said. Officials suspect that drug users are taking opioids that are "extremely concentrated or mixed with something unusual that is resulting in life-threatening situations," police said in a statement. News4's Julie Carey spoke with the sister of the man who died of an overdose last week. She didn't want to speak on camera but said the family is devastated. The man's mother had a heart attack after her son died, his sister said. 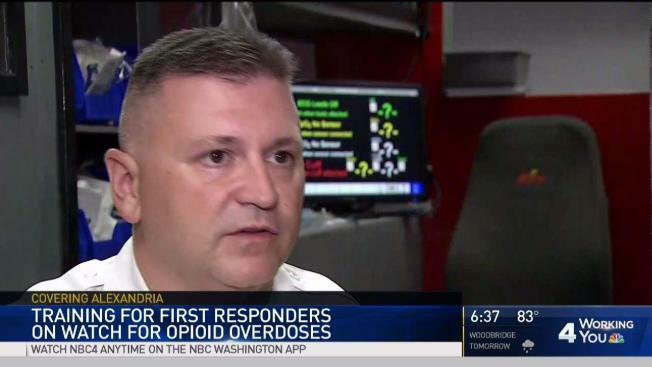 The opioid epidemic in Alexandria is not as severe as it is in other places in the Washington, D.C., area, said Battalion Chief Brian Hricik, who is the EMS operations manager. But he said he's worried the problem is growing. "It always kind of gets that hair standing up on the back of your neck, going 'OK, are we dealing with something we haven't dealt with before? Is this a new batch? Is this a new medication or drug that's out there?'" he said. "It tugs on your heart strings," Hricik continued. Medics now use the overdose reversal drug naloxone -- which is better known by the brand name Narcan -- at least once or twice a week. Officials hope that the alert they issued will make some opioid users think twice, or arm their loved one with important information. On Tuesday, first responders trained to respond to the next overdose calls. Anyone with information on the overdoses in Alexandria is asked to call 703-746-6277. For help with an addiction, an Alexandria drug user or their loved one can call 703-746-3535 for treatment services and referrals, and 703-746-3636 for detox services that are available 24/7. People who live outside Alexandria can visit www.samhsa.gov or call 800-662-HELP.